BIGH’s first urban farm is the Ferme Abattoir built on the roof of the Foodmet market hall, designed by ORG architects, on the historical Abattoir site in the heart of Brussels canal priority development area. The Abattoir site is famous for, its cellars, its listed market hall, and its lively market attracting over 100.000 people over 3 days each week. The site hosts the only city centre artisanal slaughterhouse activity in a European capital. All this food activity justifies the Abattoir’s nickname “the belly of Brussels”. Developing the Ferme Abattoir took approximately 1 year with construction starting in 2016, outdoor garden tests in 2017, and the greenhouse and fish farm completed in 2018. Full operation of the farm will be reached at the end of 2018. – The Farm’s own heat pump captures heat (allowing year long production) while offering refrigeration to the Foodmet’s butchers and retailers cold rooms. The pump is supplemented by a gas heating device providing CO2 for photosynthesis support during the day as will the main gas heater of the Foodmet, in time. – The farm aims at minimal reliance on mains water through filtered rainwater storage and well water top-up. – Electricity consumption is partially compensated by the Abattoir’s solar panels. 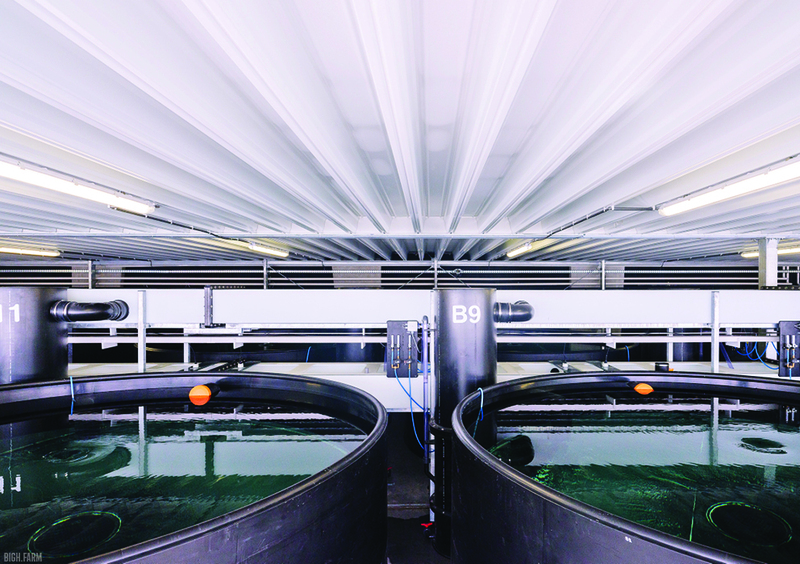 The Ferme Abattoir’s fish farm can produce 35 tonnes of high quality striped bass fish per year. Striped Bass was selected by BIGH’s experts according to both market demand, quality of water, renewable heat availability to maintain 24°c and capability to healthily grow in fresh water as in its natural estuary habitat. While the biofilter’s naturally fertilized water feeds both hydroculture and outdoor gardens, the nutrient rich water from the striped bass solid waste will also be used to fertilise the outdoor garden and more. – Fishfood: fish and plant-based pellets, certified sustainable and without GMO. – Best and unique in Europe slaughtering practice combining stunning and ice ensuring animal welfare and produce quality. 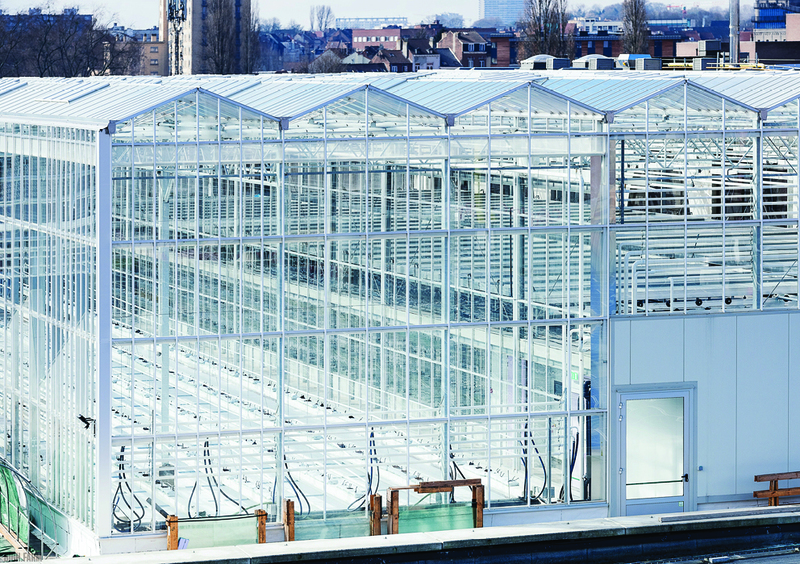 The Abattoir greenhouse produces herbs, tomatoes and microgreens in three horticultural zones totalising 2000m2 production area. Production capacity depends on varieties, sizes and temperatures. Abattoir’s greenhouse is supported by biological pollination (bumble bees) and biological pest control methods to manage potential diseases. No chemicals or pesticides are used. BIGH focuses on delicate products, unique varieties, small volumes distributed locally. Growbags by Greenyard are used for tomatoes. They combine soil substrates as structure for the roots while irrigation feeds natural nutrients and fungi increase microbiological activity in the substrate. The tomatoes and growbags are set on suspended channels. Organic potted aromatic herbs are grown on tidal tables and additional LED growth lighting enables year long production. Social partner is TRAVIE, who employs local disabled people for different manufacturing activities and urban agriculture offers them to diversify their portfolio. The outdoor garden first 700 m2 have been cultivated since 2016 and its total area of 2000m2 will be developed over time. 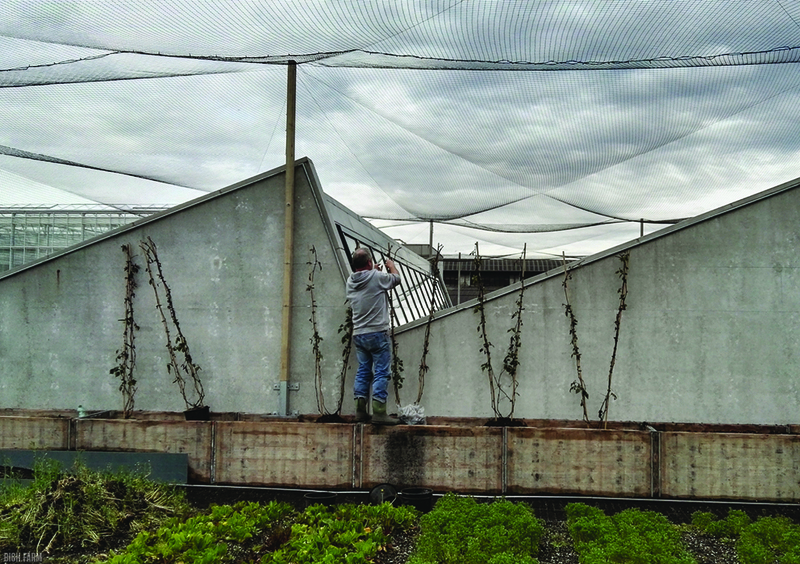 Probably the current largest rooftop productive garden in Europe, BIGH is also pioneering new farming techniques on rooftop outdoor substrates to eventually achieve economic viability based on product sales. The outdoor garden is an opportunity to create a productive living substrate on a rooftop, with the aim that it can be recreated elsewhere. Productivity, taste, profitability as well as resilience of the soil are key to sustainable urban farming development as a whole. 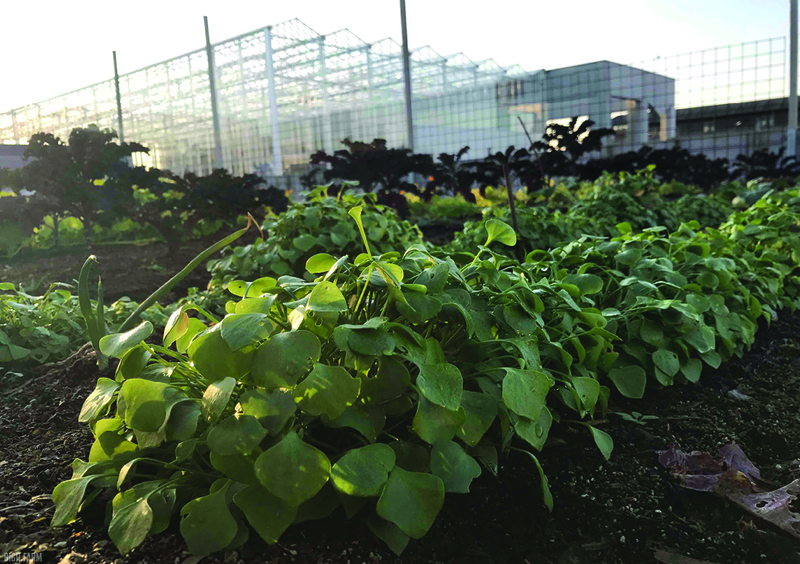 Salads, vegetables, small fruits and Mediterranean climate species benefits from the roof’s microclimate and aquaponic water irrigation. The outdoor garden is managed with our social partner Atelier Groot Eiland in addition to their own gardens, food shop and restaurant near the canal. A two part tour, starting with a 30min tour of Ferme Abattoir, followed by a short walk to the urban farm of our partner Atelier Groot Eiland. There you’ll get to see a very different urban farm in action, and get a meal and a drink in their own restaurant, using produce grown onsite.